Is it possible to get somehow to the Fuji Shibazakura Festival from Lake Motosu not returning to Kawaguchko Station? You can take a regular local bus(路線バス), non-reserved, only 3 in a day. About 5 min short ride fr Motosuko(本栖湖) or 7 min fr Motosuko-iriguchi(本栖湖入口) bus stop. Anyway, find "For Shin-Fuji stn. (新富士駅 行き)" bus timetable, ASAP. Motosuko-iriguchi bus stop is fixed, no problem. Also couldn't find bus fare, bc fes place stop is not regular, no listed. But maybe 330Y or a bit cheaper/oneway adult. Also you can ask at Lake Motosu Tourism Association office. There seems to be a rental cycle, but no cheap, no recommended it. but don't know "where to go?" after fes site out. so it will be faster "hitchhike" at car park than waiting for a limited bus. The three local buses leaving Fujisan station at 9:00, 11:00, and 14:00 should stop at both bus stops; Motosuko and Motosuko Iriguchi. This is the timetable for buses from Fujisan station to Shin-Fuji station. 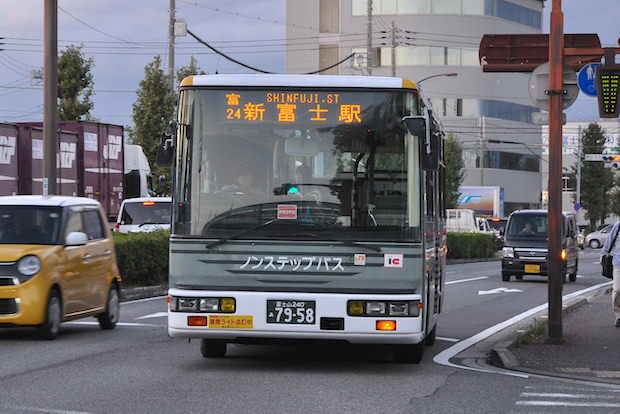 There are four buses bound for Shin-Fuji marked with the green color. The remaining bus at 18:00 should pass the Fuji-Shizakura Festival Site. The site should close by that time. The opening hours are from 8:00 to 17:00.